Reading a funny billboard? Reaching in the back seat to grab something? Making 4th of July plans in your head? You’re driving distracted. There is one major distraction that actually involves all 3 keys above…texting. and think to yourself – it will only take a second. Realistically, try 5 seconds. 5 whole seconds you are behind the wheel moving but you are completely focused on a text message. What is that – like 3 feet maybe 10? More like 20 seconds. Lets do the math, shall we? You are driving down I10 going 55mph. Your BFF Jill texts you and without even thinking you open it to read. 1…2…3…4…5. You just traveled the length of a football field. “This issue has become more dangerous than drinking & driving” – Edgar & Snyder Associates have discovered. The National Safety council reports that cell phones ALONE are responsible for 1.6 million motor vehicle accidents each year. It’s Summer vacation now. Your teens are out with their friends, living the life we all remember so well. They have been waiting for that day of receiving their license for what feels like eternity. But what is the most exciting time for them, is the most anxious time for a parent. The scary truth is, new drivers are far more likely to be involved in a distracted driving accident than experienced drivers. Car accidents are the leading cause for teen deaths in the U.S.
16 & 17 year olds are 9 TIMES more likely to have an accident than middle-aged adults. 61% of teens admit they aren’t always focused on the road at all times. Teens are more likely to underestimate risky driving conditions, or not recognize them at all. To teens, these scary statistics and driving rules have been imprinted in their brains from many adults time and time again. It almost sounds like a broken record to them at this point. It’s these little imprints over and over again that may just save their life. One reminder to take precaution before they get behind the wheel can help avoid a potential accident. You hand them the keys and they’re off. It’s out of your control, or so you thought. Below are some ‘Dagley’ tips for parents of teen drivers to help them behind the wheel and to help you worry less (like that’s possible?!). Phones – Again back to the distracted driving. Try showing your teen the statistics about the dangers behind the damage of 1 text message. Have them take a pledge about zero phone use behind the wheel. If they break the pledge, no more car or phone! Friends – We remember the days of driving and jamming to music with our friends going from point A to point B. Sometimes it felt like we found an excuse to go somewhere just so we could drive and listen to N’SYNC (or was that just us?) Limit the amount of friends they can have at a time for a while. Texas law does it, so why not us parents? Practice makes perfect – Obviously no one would let someone behind the wheel if they didn’t know what they were doing! I’m sure when everyone is on an airplane they are hoping their pilot is well equipped to fly that aircraft. Exact same with a car! Hand over the keys when you feel they have tested it out with you the parent as much as possible and have spent many hours educating themselves while practicing. We don’t want to harp on teens only. Lets face it, adults are just as guilty when it comes to texting while driving. 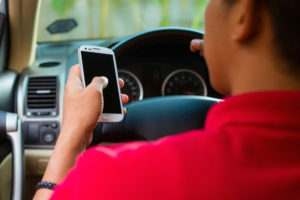 Is it realistic to expect all drivers in the world to end distracted driving? Probably not. What is realistic is taking control of YOUR own driving as well as taking extra precautions. Dagley Insurance is up for the pledge to take control, are you?